Kayaking tourism has appeared in Halong Bay junk since the early 90s of the last century. At first, kayaking was mainly for foreigners who were keen on adventurous sports. But nowadays, domestic visitors, especially active young people who like to explore, are also very interested in this type of tourism. In Halong Bay, there are thousands of limestone islands with different sizes and shapes standing in the middle of the waves and striking in blue sky. For many visitors, the most interesting thing is that they are able to row into the caves to explore the numerous stalactites that are created with many strange shapes. Especially when kayak goes into the lower caves, people have to cling to the cave and push the boat, or sometimes they have to lie on the boat to pass through the cave. According to experienced people, kayaking is a dangerous sport for those who do not know how to swim or lose their temper easily. However, to feel the majestic beauty of Halong Bay and discover rocky cliffs, gorgeous rapids, visitors should not miss this opportunity. Tourists can choose to row alone or with friends for safety to explore Halong Bay in their own way. But if visitors follow the instructor’s specific guidance, they will find the rowing extremely simple and fun. Each kayak has two paddlers. People might be unfamiliar with the kayak at first but then visitors will get used to it step by step. And everybody is interested in boating when coming to floating village of Halong, watching the work of fishermen on the water. Paddle the kayak near the foot of the rock is one of the favorite experience of visitors coming to the sea. Because when the kayak weave through unnamed islands, tourists would have chance to honor the beauty of coral reefs, tiny flocks of fish, and so many other exotic flora and fauna. Kayaks are made of composite plastic, rubber or inflatable boats with oars. The islands such as Hang Luon, Ba Dung Dao, Ba Ham, Dau Be, Hang Co … are suitable places to contemplate and kayak. 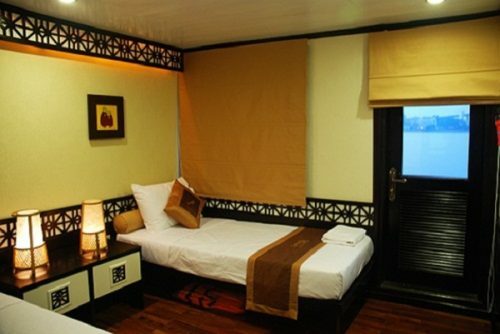 Once travelers come to Ha Long Bay, they should try to make a tour of floating fishing villages as follows: Vung Vieng, Cong Dam, Cua Van, Vong Vieng,… to discover beautiful sceneries on the bay as well as the daily life of local people here. As tourists, people can join night cruises on luxurious yachts to experience free kayaking. 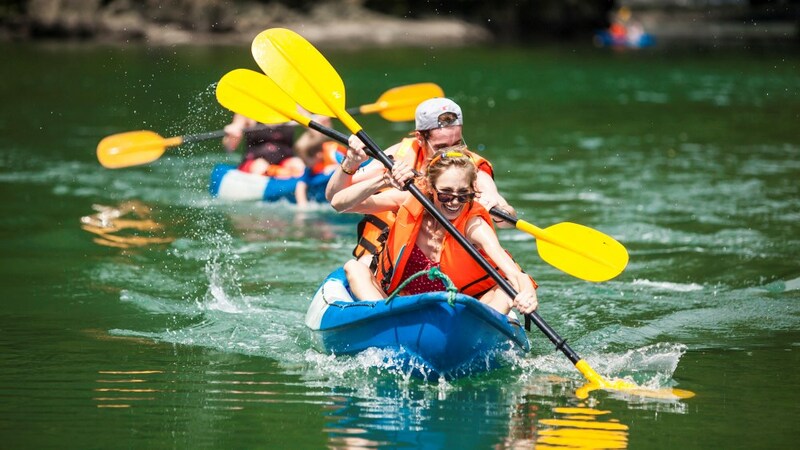 Because this is an activity in the night tour program, most cruise ships are equipped with kayaking boats to let tourists sightsee by themselves in beautiful and safe locations. 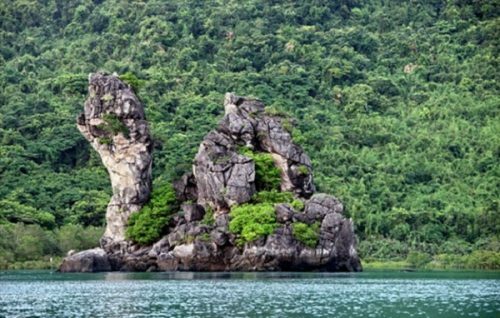 On the other hand, if travelers are only looking for kayak experience without going according to tours, they can take the train to places such as Ti Top Island, Sung Sot Cave, Bo Nau Cave, Vung Vieng floating village… to hire kayaking boats with reasonable price. 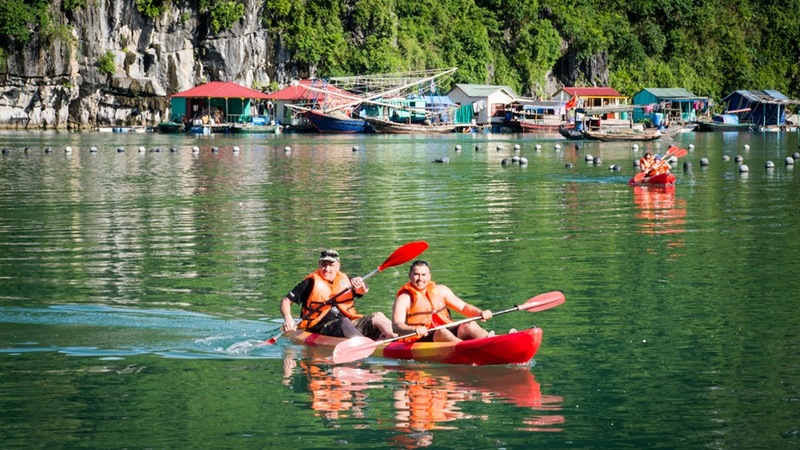 Along with popularity at some tourist destinations such as Cat Ba, Ha Long, Vung Tau or Nha Trang,… kayaking on the water in Halong Bay is a new experience for visitors especially lovers of water sports. 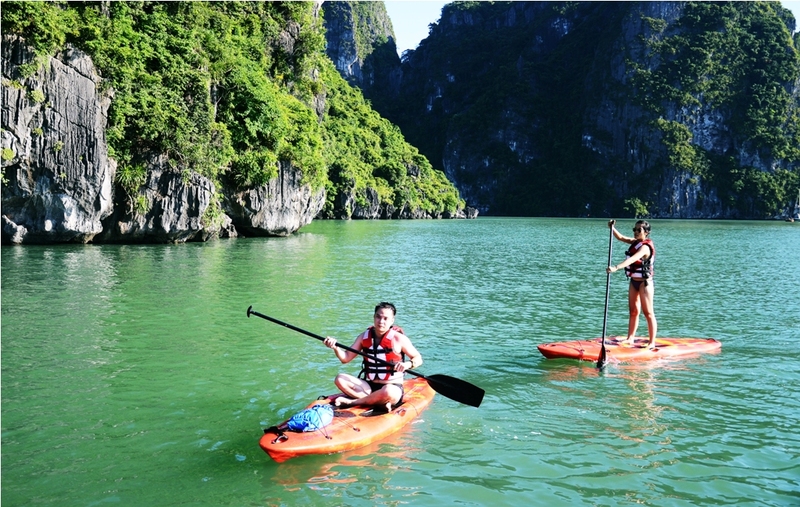 Kayaking is wonderful thing to do if travelers want to explore and feel spectacular Halong to the fullest.